Mix equal parts, by volume, ground conch and onions. Add remaining ingredients and just enough milk to make a thick batter. To form the fritters use two spoons. Dip one spoon into the batter. Use the back of the second spoon to slide the batter off the first spoon into the hot oil. Fritters should be the size of golf balls. Fry until golden brown. 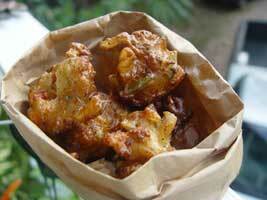 Do not put too many fritters in the oil or it will cool and fritters will be greasy. You want onion slivers to stick out and get extra crispy. Serve with lime wedges and Louisiana hot sauce.